St. Elizabeth was the daughter of King Andrew II of Hungary and Gertrude Merania. Her ancestry included many notable figures of European Royalty. She was born in Hungary, and lived in the Castle of Posonium. Elizabeth was brought to the court of rulers in central Germany, to become betrothed to Louis IV, of Thuringia, to reinforce political alliances between the families. The Thuringian court raised her from the age of four, so she would be familiar with the local language and culture. In 1221, at the age of fourteen, she married Louis, and he was enthroned. In 1223, the Franciscan Friars arrived and the teenage Elizabeth not only learned about the ideals of St. Francis of Assisi, but also started to live them. Louis was not upset by his wife’s charitable efforts, believing that the distribution of his wealth to the poor would bring eternal rewards. It was about this time that a Franciscan Priest gained influence over Elizabeth when he was appointed her confessor. In the spring of 1226, floods, famine, and plague brought havoc to the area, and Louis had to go to Cremona, to represent Frederick II. Elizabeth assumed control of affairs at home and distributed alms in all parts of their territory, even giving away state robes. She built a hospital and visited the patients daily to attend to them. Her life changed drastically on September 11, 1227, when Louis, in route to join the Crusade died of a fever in Italy. After his death, his brother Henry assumed the regency until Elizabeth’s oldest child Herman became of age. Elizabeth moved out, and made solemn vows similar to those of a Nun. These vows included celibacy, as well as complete obedience to Konrad, who became her confessor and spiritual director. Konrad’s treatment of Elizabeth was extremely harsh, and he held her to standards of behavior, which were almost impossible to meet. He ordered physical beatings, and for her to send away her three children. Her pledge to celibacy proved a hindrance to her family’s political ambitions. She was held hostage at Bavaria, the castle of her uncle, Bishop Ekbert of Bamberg, in an effort to force her to remarry. She held fast to her vow, even threatening to cut off her own nose, so that no man would find her attractive. She went on to build a hospital at Marburg, for the poor and sick with the money from her dowry. She ministered to the sick and continued to give money to the poor. In 1231, she died in Marburg, at the age of twenty-four. Although the Franciscan movement didn’t have an official ritual at this point in time, she is associated with the Third Order of St. Francis, a lay Franciscan branch of the Franciscan Order. She was canonized in May of 1235, four years after her death. She is best known for her “Miracle of the Roses” which says that while she was taking bread to the poor in secret, she met her husband, who in order to quell suspicions that she was stealing treasures from the castle, asked her to reveal what was hidden under her cloak. In that moment, her cloak fell open and a vision of white and red roses could be seen, which proved that God’s protecting hand was at work. Another popular one is St. Elizabeth laid a leper in the bed she shared with her husband. Her mother-in-law, who was horrified, told this to her husband on one of his returns. He removed the bedclothes and at that instant, “Almighty God opened the eyes of his soul, and instead of a leper he saw the figure of Christ crucified, stretched upon the bed”. He never doubted her again. 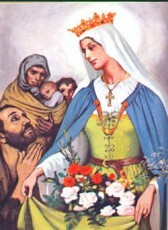 St. Elizabeth of Hungary, was born into a royal family. Her family had arranged a marriage for her, at the age of fourteen for political reasons. She was a humble wife, and raised three children. Her husband died early in their marriage, and she became interested in the religious life. She became a Third Order Franciscan, something that Lay people can enter into, to live a more devout Christian life. She also died at a very young age, twenty-four. Many miracles of healing were reported after her death, both at her tomb and through her intercession.